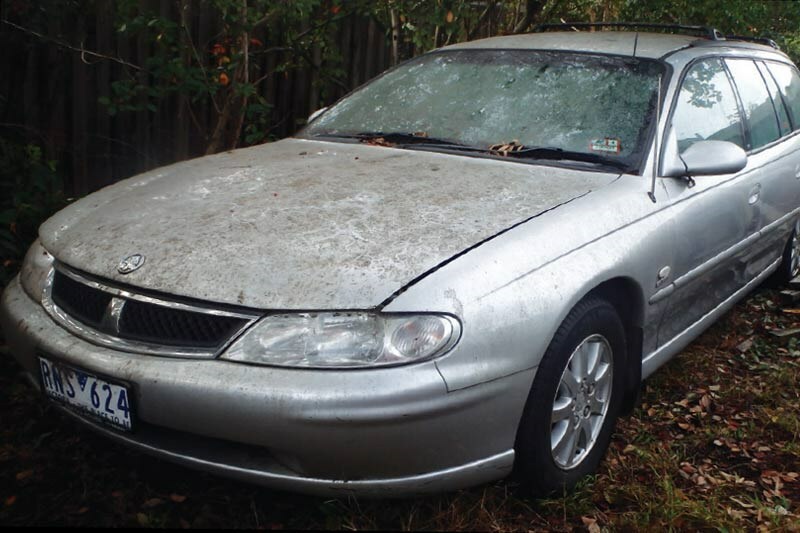 Last month, I stumbled upon a bargain Holden Commodore wagon for $1000. These days, I reckon any Commodore wagon for a lazy large is a bargain, but what made me grab this one was the fact it was a reasonably tidy 2002 VXII Berlina with General Motors’ mighty all-alloy LS1 V8 under the bonnet! It was the perfect alternative for the also-LS1 V8 Statesman I bought a while back – intended to be a daily driver – and then had a sook about a couple of issues ago because the engine was dek-cuf. Once again, Morley was involved… It was his old mate Bondini who had the car sitting in his front yard and who I couldn’t get the money out of the auto-teller machine quick enough to pay. To cut a long story short, Bondini simply didn’t have the time to get the Berlina going again… Yes, there was a reason the Berlina was so cheap – drum-roll please – half the engine was sitting in the load area instead of in its proper place under the bonnet. But for a grand I couldn’t go wrong, could I? I knew I was taking a risk on this car as with the intake manifold, one head and the passenger-side exhaust manifold sitting across the back seat, there was no opportunity for a test drive. But even if I had to tow the car to a workshop and get a second-hand engine dropped in, my $1000 Berlina wagon would always be a bargain. Or maybe not. As I write this, I’ve just booked a flight to Melbourne – I live in NSW – to collect the car. A few weeks ago I drove down there to reassemble the top end of the donk at Morley’s workshop. To get things running, my ‘new’ VX Berlina needed a cylinder head gasket and fresh head bolts – the LS1 ones can’t be reused like the old-school iron-lion Holden ones can. While I was in the parts shop, I bought a 10lt tub of oil and a filter, plus an exhaust gasket and some gasket goop (for the exhaust’s flange join under the car). That all added up to around $400. I grabbed some degreaser and carby cleaner – another $30 or so – and a new battery as the old one was munted from sitting in a front yard for two winters and summer. That’ll be another $160, mate. I also needed some 600-grade abrasive paper to de-rust the bores of the left-hand cylinder bank – time outdoors had left them rusty; thankfully not so badly as to pit the cylinder walls. Coolant – that was another sixty or eighty bucks. Trans fluid for the power steering and maybe the trans itself: $40 . As soon as we got the LS1 going (and we tipped-in $20 of fuel to do so) it was obvious the power steering pump was rooted, too, so when I got back home from my weekend of spannering, I bought a second-hand pump from my local wreckers for $120 and mailed it down… Another $15. I sent an oil pressure sender too ($120) as according to the Berlina’s instrument cluster warning light, it’s highly likely the old one is stuffed. On that fix-up trek, I drove my VN Calais V8 and although I did some other worky-type stuff while there, it was a $350 fuel bill. Oh, and that time, I’d originally planned to fly down and had booked the flights… No refunds on that so I walked away from a $200 fare. Plus there’s 36 hours’ worth of drive-time (home to Melbourne and back one weekend to fix the engine, plus the one-way trip driving the Berlina home) and the stack of Sydney and Melbourne tolls to pay. From that first $1000 that I gave Bondini at the pub, my bargain-buy Berlina now owes me way over $2.5k and a reasonable weeks’ worth of time. Redbook reckons it’s worth a maximum of $4400. And I haven’t got the thing safety-inspected ($80) or registered (another $1000 or so) in NSW yet, nor re-gassed the feeble air-con or fixed a few dents! Looking at the bucks I’ve spent on the Berlina so far made me look more closely at another project I’m working on: a VB Commodore SL/E restoration. It began as an $1800 car in carport but with parts (everything from the door handles to the dashboard needs to be replaced) it owes me about $4k, and I haven’t started work on it yet! It just goes to show how quick the bills with an ‘unfinished project’ can escalate! Anyhow… there’s more to the story than a one-owner, low-kays Berlina wagon. Oh yes, in a situation that seems to have shadowed my every move with cars in the past two years or so, Morley was involved!